Sieve flour into medium mixing bowl; add ghee and mix with fork until mixture looks like cornmeal. Stir in only enough water to flour mixture until moist enough to be gathered into a rough dough. Knead dough in bowl with hands to form a soft pliable dough. Cover with damp cloth or paper towel and allow dough to rest about 1/2 to 1 hour. Divide dough into equal-sized balls about the size of a peach. Flatten and roll dough balls with rolling pin, rolling from center to edge. Try to make edges thinner than center; thin rounds should measure about 6 inches across. Dust dough with additional flour if dough is sticky. Cook on a hot frying pan (tava). When the color changes on the top and bubbles appear, turn dough over. When both sides are done, remove roti from pan. Repeat the cooking and shaping process until all dough balls are cooked. Brush cooked roti with ghee and place them in a towel-lined bowl one on top of another to keep warm. Tip: If using a gas stove, hold the cooked roti over a medium flame and it will puff up immediately. Turn quickly to flame-bake the other side. Do this several times taking care that the edges are well cooked. 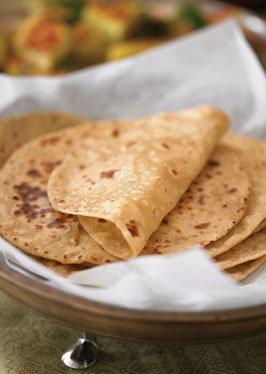 If using an electric stove, roti can be encouraged to puff by pressing the edges against the side of the pan with a clean kitchen towel after the first turn on each side.